All 12 seniors on Jefferson County’s football team have been signed to college scholarships. It comes amid the district’s second year as the state’s first and only charter school district, and on the heels of a consolidation of schools into one facility. 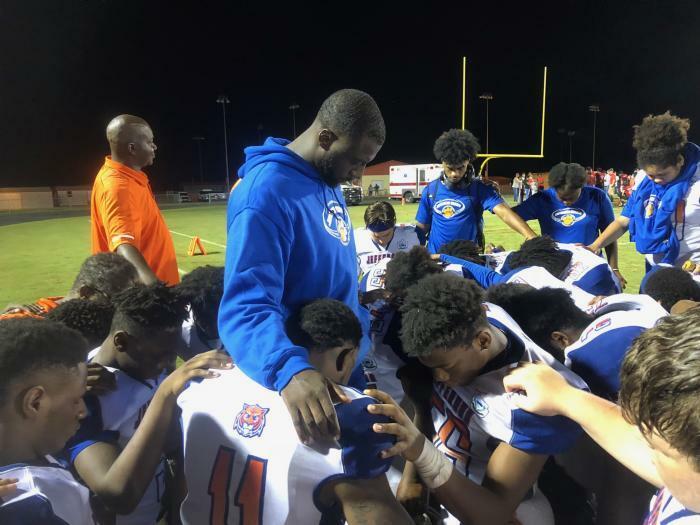 Jefferson Somerset's football team takes a knee ahead of a game. (undated photo). Last year, Jefferson earned the highest school grades seen in more than a decade, and this year, another accolade: all 12 of its senior football team members have earned college scholarships. Football coach Leroy Smith addressed the state education board Tuesday and talked about the need to support the dreams of his students. He spoke of one student with a 4.2 GPA and dreams of playing football, "and people around told him he couldn’t, he wasn’t good enough," Smith said, before highlighting another player. Smith says when he took over the program last year, he wanted to focus on showing students opportunities outside Jefferson County, so he took them on college tours. Smith played football for Florida State University and also played professionally for a few years. He’s from Gadsden County and says growing up in a rural area has informed his approach to teaching in Jefferson. Smith runs a non-profit called Diamonds in the Rough, which combines athletics with academics. The Jefferson Somerset Varsity team had a 7-5 season and was ranked #4 in the 1A-8A Division. Smith was named District Three FACA 1A Coach of the Year. He says, he team could have won a state title. But his focus was on getting his students to college. The Tallahassee Democrat featured Smith and the Jefferson Somerset football program in February. Two years after being forced to become the state’s first and only Charter School District, North Florida’s Jefferson County is being touted as a model for improvement. Now Jefferson Somerset Academy is sharing what its learned so far with members of a House Education Committee.